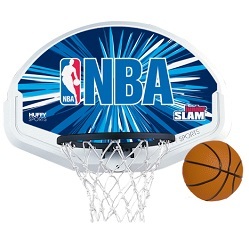 Free shipping to the lower 48 United States for this door mounted basketball goal. 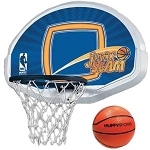 Set up a quick basketball game with this Spalding youth basketball system. Great for indoor use. Easy hangs for most doors. Comes with a 4 inch inflatable basketballs. The 19 inch backboard width provides some shooting area for bank shots. Challenge your friends and family with fun, indoor trick shots. Easily hangs from most doors. Set up and take down easy with this system. Fun for younger kids, or for setting up a challenging indoor game. Comes with an inflatable basketball. Basketball size: 4 inch diameter. Quick Ship! Generally leaves the warehouse within 1 to 2 business days of ordering.